Oracle Data Integrator 10.1.3 is a great tool and can even run fully functional against Oracle Express which is the only free Oracle database product available. This limited database has it’s draw backs for production use. If Data Integrator is executing scenarios real time, or if the logs are never cleared it could quickly exceed the 5GB storage limit and this nasty error could show up. 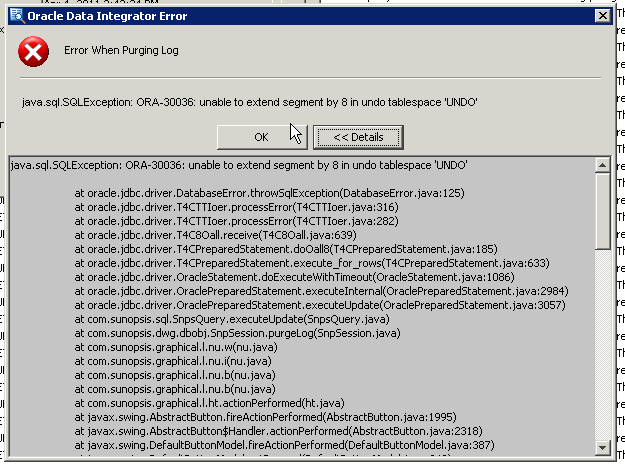 The problem is Oracle Express can’t extend the tablespace. Ultimately once the undo tablespace is full all reports need to be removed manually before a purge logs can be executed. Otherwise manually remove all reports and then purge using the command line or trash icon. Hint selecting multiple and right clicking ‘delete’ reduces the selection to one item. Instead select multiple and press delete key. If this doesn’t work delete the contents of the reports tables. I’d start with the SNP_EXP_TXT table because this could have 50million+ records.